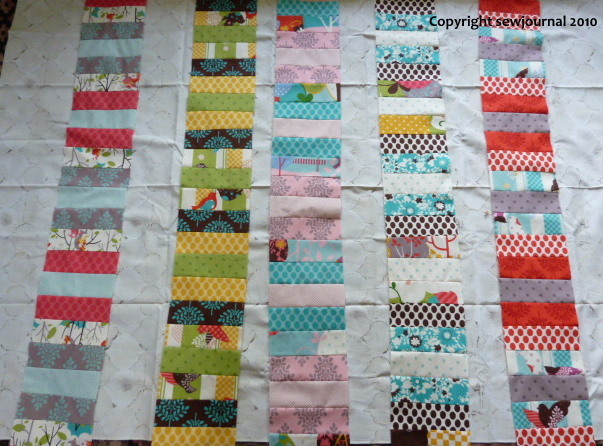 It’s been quite difficult to choose a background for the It’s a Hoot baby quilt. 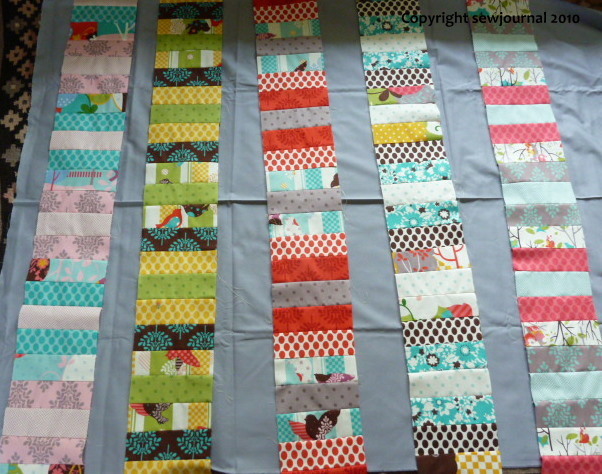 I’ve auditioned five fabrics based on suggestions received and my own feelings. You can see them below. I’m not sure any is really good. This fabric is an African Bezin fabric I bought from a an African American store in Washington DC on my last visit. This one has very small spots but you can’t really see them. I quite like this one. You know I tink a chocolate brown may be nice. What do you reckon? Well, I have to say I like the bright one…..8-], but it doesn’t look as good with some of the colors as it does with others. I’m afraid I don’t like any of the greys or the white. The chocolate brown might be it! I’ll be looking forward to seeing it! I hauled in of your pictures into the Paint program and just quickly colored in between the columns – I really liked a light aqua. Try doing this once. I like the yellow and I also prefer the green strip being in the middle. The yellow “warms’ the colours” which is really good for training a baby’s eye. 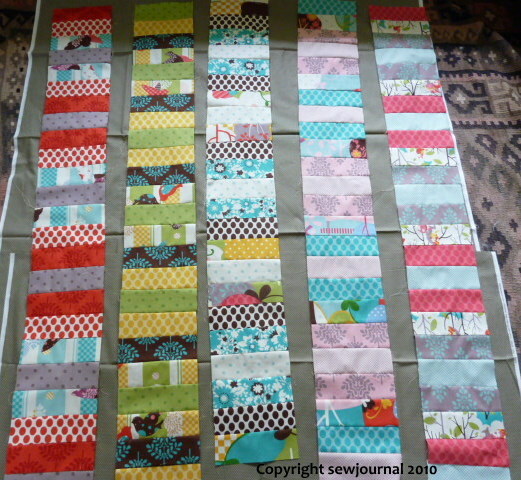 I always put bright colours into baby quilts as they help to provide outside stimuli to babies’ brains. Thanks for your comments ladies. I hummed and hawed about this late yesterday and then I had an idea and I’ve gone with that now. It’s none of the above photos I can tell you that much. I’ll hopefully be able to show you tomorrow. LOL It just goes to show that we are all different in our tastes. I don’t like that bright yellow one at all. To my eyes, it leaps out at me too much and hides the colours. My preffered is the white, but then, I’m a fan of crisp white with fresh colours. 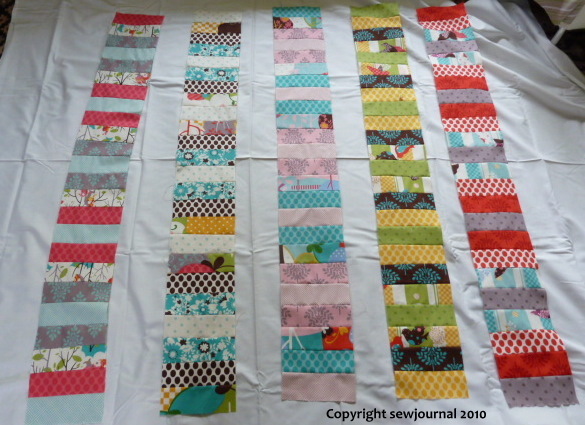 I’d still try the tiny spot, but spot on white, or perhaps white with a coloured thread quilting. In the end, Munaiba, it will have to be what appeals to you, because everyone will have a different preference! I like the small spots best. What about a grey/beige linen, similar to the one I was using last I saw you?